On the 125th Birth Anniversary of Dr. Babasaheb Bhimrao Ambedkar, Centre for Constitutional and Administration is inviting papers. The proposed essay writing competition will provide an interdisciplinary forum to present views on importance of Ambedkar’s ideas, ways to empower socially oppressed and ostracized groups, exploration of policies and practices to reform current system to encourage marginalized masses and strengthening judicial approach to engage with pressing demands for social justice. The basic purpose of this event is to create a meaningful dialogue on social justice agenda through active participation of intellectuals. All students pursuing graduate, post graduate courses. Each submission can be co-authoured by a maximum of two members on any one of the below mentioned topics. A soft copy of the essay must be submitted ccalessay@gnlu.ac.in on or before 31st October 2015. The essay must be sent as a word document (.doc or .docx) and in a PDF format. 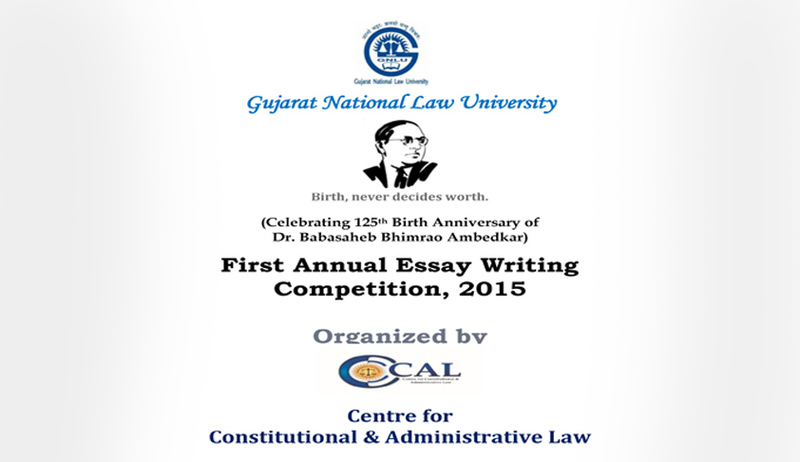 The email should carry subject as “Submission CCAL-GNLU Essay Competition-2015”. The essay must be accompanied by the following documents: o Scan copy of University/Institution Identity Card. LENGTH – The word limit shall be 2500-3500 words excluding footnotes. 0.25 marks shall be deducted for each violation of the aforementioned formatting rules. The submissions shall be subjected to an initial screening by the screening committee constituted by the CCAL. The authors of the short-listed submissions shall be intimated accordingly. The essay must strictly be original and should not have been published elsewhere. Partial or complete plagiarism will lead to immediate disqualification. The main body of the essay should not carry any mention of the name, contact details, or the name of the institution. In any other case, it shall lead to immediate disqualification. Multiple submissions by a participant(s). Late submission of the essay. The winner shall receive a cash prize of Rs 10,000. The first runner up shall receive a cash prize of Rs 7,500. The second runner up shall receive a cash prize of Rs 5,000. Publication Winning essays at the discretion of the editorial members may be chosen for publication in a Journal with an ISBN number.